Break two eggs into 250gms of whitebait. Add ½ tsp baking powder if desired. Melt butter in frying pan until just golden. Fry patties, turning once white/golden. Eat between two pieces of bread with salt and pepper, lemon juice or mint sauce. Whisk together egg, cornflour, salt and pepper. Gently add whitebait and mix. Coat a frying pan with oil or butter (clarified is best) and spoon generous helpings of the mixture into the pan. 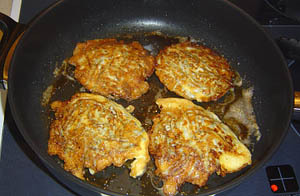 Flip the fritter when it is beginning to brown-but be careful not to overcook or the fritter can become tough. 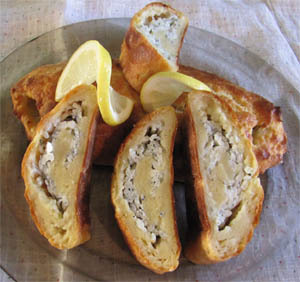 Squeeze a little lemon juice on the fritter while it is still in the pan-just before it is finished. Serve with more lemon slices. 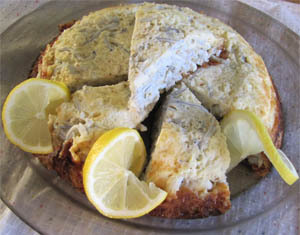 Recipe from "The Whitebait People"
Soft, fresh breadcrumbs-you can use as much as you need but start with about ¼ cup. White breadcrumbs are traditional but brown gives an interesting flavour and texture. Beat eggs well, and then add other ingredients. Heat butter in saucepan and fry tablespoon lots of batter on both sides. Separate two eggs and set aside whites. Beat eggwhites until stiff. Add dessertspoonful of selfraising flour, pinch of salt and egg yolks. Fold together. Add 250gms whitebait and fold in. Melt butter in frying pan until just golden. Fry patties, turning once golden. Enjoy with lemon juice, mint sauce, salt and pepper etc. Remember Aunty Betty's tip and clip the edges with a pair of scissors if you want them perfect! Mix together flour and baking powder in a bowl. Make a well in the centre. Beat egg and chives slowly into flour mix. Add milk and mix to a smooth batter. Add lemon juice, lemon rind, whitebait, salt and pepper. Mix together gently. Heat a fairly heavy pan. For each serving add 1tbsp of butter and 1-2 chopped garlic cloves. You need a minimum of ½ cup of whitebait per serving. Cook on low heat for 3-4 minutes. Chop 2-3 tbsp of parsley and have it ready. Spread the whitebait on a clean, dry teatowel. Remove any foreign matter. 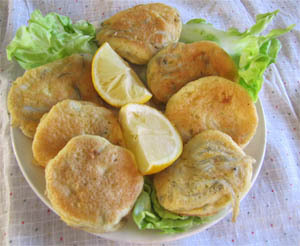 Sprinkle dry whitebait with flour, lifting the sides of the teatowel to coat the fish evenly. Raise the heat of the garlic butter and add the coated whitebait (without adding any of the loose flour) as soon as the butter turns straw coloured. Toss, using a fish slice, until the fish turns milky white in just a few seconds. Sprinkle with parsley and with freshly ground black pepper. Tip onto a warmed plate and squeeze a little lemon juice over them. Eat immediately. 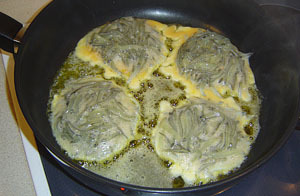 Proceed as above, using a small pan. As soon as the whitebait turn milky, pour over them an egg which has been beaten with a pinch of salt and a tablespoon of water. 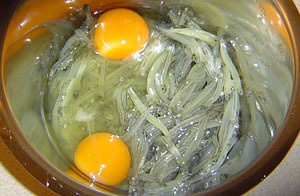 Shake pan to spread both whitebait and egg. Lift edges to let uncooked egg run underneath. Fold omelet and serve immediately. Note: Allow at least ¼ cup of whitebait per serving. Saute' shallots in butter. Add garlic and wine and reduce to half by boiling. Add cream and peppercorns and reduce again. Add salt and nutmeg. Keep warm. Cook pasta and drain. 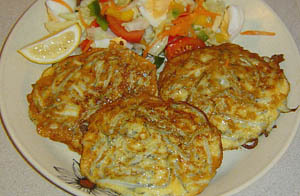 Cook whitebait in the hot sauce 1 minute. Twirl pasta onto plates, pile whitebait on top, spoon on sauce and top with Parmesan and parsley. Mix flour, baking powder and potatoes. Add melted butter and beaten egg. Roll out and spread evenly with whitebait, onion, pepper and salt. Roll up. Bake in pie dish for ½ hour @ 180 degrees C / 350 degrees F.
Warm milk and butter until melted. Pour over bread and let soak in. Beat bread to a pulp. Add egg yolks, pepper and salt. Gently add whitebait. Fold in stiffly beaten egg whites. Pour into battered casserole dish and bake 20 mins @ 200degrees C/400 degrees F.
Method: Grate butter into flour and add salt and Baking Powder. Mix together with just enough water to bind. Roll out pastry and line a 25cm tart plate. A sprinkle of semolina or polenta in the tin before you line it will help removal later. Method: Beat together the eggs, milk, cream, dill pepper, salt and lemon zest, then stir in the whitebait. Pour the mixture into the prepared shell. Bake for approximately 45 minutes at 180 degC.